The Philippine Embassy confirms that the Commission on Elections has started sending out mailing packets directly to overseas Filipino voters in Germany for purposes of the 2016 Philippine National Elections. Consul Adrian Cruz, in his opening address to participants to the 5th Filipino Basketball Tournament held at the Sportshalle Sachsenweg in Hamburg, asked the support of the Filipino community to inform Filipino registered voters in Germany to return their sealed ballot envelopes personally or by mail to the Philippine Embassy before May 9, 2016, the day of the elections. The Philippine Embassy in Berlin is among the Posts that adopted the mode of postal voting, where mailing packets, containing the official ballots, are sent directly to the voters or directly to the post from COMELEC. 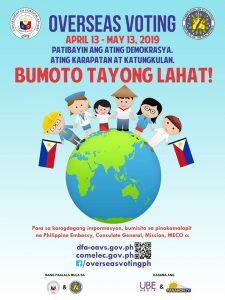 For voters that have received their mailing packets, they may either mail or personally deliver the accomplished ballot to the Philippine Embassy. In the meantime, the Embassy’s Special Ballot Reception and Custody Group (SBRCG) has confirmed it has received mailing packets that were undelivered by the German postal office. In the event that a registered voter has not yet received their mailing packet, they should immediately notify the Embassy and provide their name, telephone number and complete mailing address. Sending an SMS to the Embassy duty phone mobile no. +49 173 5215 703, whereby they will be contacted by a consular staff.